Each website design is special and unique in its own way. And so is the experience of building a website. Each new project brings with it new challenges; which triggers creative thinking in all new way. Right from designing the logo and deciding on the color-scheme to adding the critical functionality, each project is carried over the stages of maturity to establish the purpose of the website and build a successful online identity. Each project completed successfully is a reward in itself. Clients testimonials and users appreciation encourage us to thus to take it a step further; to share the experience with our readers. Thus, here we are describing the process of gaining happy clients — the process of taking a website from a raw concept to fully accomplished website. 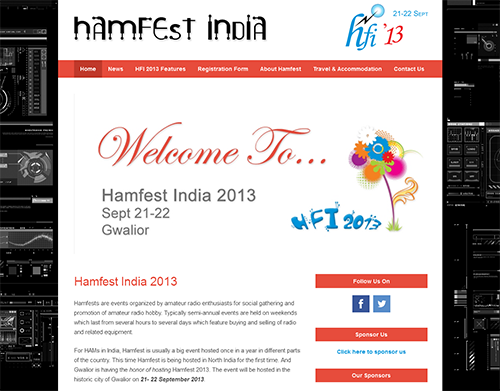 Let’s start with one of our recently completed projects — HamfestIndia2013.Com. 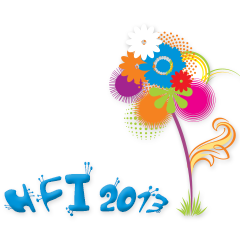 HamfestIndia2013 is the official website for Hamfest India 2013; a tech-event conducted every year in different cities of India since 1991. The main objective of the fest is to create an awareness of Ham Radio along with the new technological skills in the field of communication. Hamfests are not only associated with India, these events are organized by amateur radio enthusiasts all over the world. The basic idea of Hamfests is to share & promote Ham related information and to provide a platform for buying and selling radio and related equipment. To make it easy for the visitors from around the globe to communicate with the event hosting team. Looking at the client’s requirement, we opted to design a WordPress website backed by ever so flexible and professional theme — The Genesis Framework. It was fun developing a Genesis child theme with custom registration form, Google Maps integration, dynamic page layouts and customized page views. The design process starts with a raw concept taking the shape of a wireframe, then over to Photoshop for a mock which is finally implemented to the website. However, this project did not move the established path. We got started with the typical functionality of creating a custom registration form, then to add support for google maps and finally when the website was functionally sound, we got our hands on the design aspect. Sometimes thinking about the design aspect at the last hour pays you off with indispensable creative ideas. This is what happened with this project. Looking at the client’s worries about getting the critical functionality right, we decided to get started with the serious coding part and later sifted to add the visual appeal to the website. Logo design, background graphics, bold color scheme, parallax scroll, ken burn’s effect for image slider all the later additions refined the visual identity and added a dash of techno-event to the website. Registration Functionality: With so many WordPress plugins at developers disposal, online registrations is not a big deal. But the client requirement made us think of a better solution. The client wanted to list the specific registration details on the Registrant’s List page with the ability to update registration status of multiple registrants in one go. We thus created a solution where each new registration was stored as a custom post type with the data from the form fields stored in the custom fields. This made it easy for us to implement the second special feature of the webdesign project. Custom Registrants List View: This custom page view displays the specific registrant details along with a field called Status. The specialty of this list view is that when the user is logged-in as admin, he can update the status of multiple registrants in a single go. When the user clicks on the Update Status, a query is triggered that updates Status custom field of all the Registration post types. Tour Guides With Google Maps Integration: The website includes a tour guides, which lists the accommodations and tourist places in the vicinity. The description was topped with programmatic inclusion of Google maps. Visual Identity: This one required a lot of inspiration and a brainstorm session to get the look and feel it has finally acquired with appropriate background graphics, bold and beautiful reds and circuitry font for the header. We enjoyed doing this project — on creative front as well as the coding front. As much as it was a challenge to get the registration functionality in place, building the visual identity piqued our creative thinking process. I still remember the last hour decision of including a image slider with Ken Burn’s effect. Well, all the efforts were paid off with the appreciation at the website launch party and users comments that followed for quite some time. Custom website design; which truly reflects the visual identity. Top Notch SEO; to help the client’s site rank better in the search results. Google Webmaster tools set up for detailed reports about visibility of pages in Google. This one goes without a miss! All your efforts are paid off with a successful website and a happy client. Our client Mr. Jayant Bhide was absolutely impressed and regularly shares his website users’ feedback with us without fail. Would you like to work with us too!